Principal Peter Noack, Perth Airport’s Fiona Lander and college students Ebony Lang and Matthew Estacio. Book Week runs from August 23 to 28 every year with the help of businesses committed to supporting the reading initiative. This year, the Children�s Book Council of Australia celebrated its 70th anniversary with the theme �Books light up our world�. Perth Airport and Dymocks Children�s Charities visited the college in Forrestfield on Monday to make the $5000 donation. Darling Range Sports College principal Peter Noack said he was delighted to receive the contribution to the school literacy and reading program. �The $5000 makes such a difference to the additional resources we can provide for our students,� Mr Noack said. 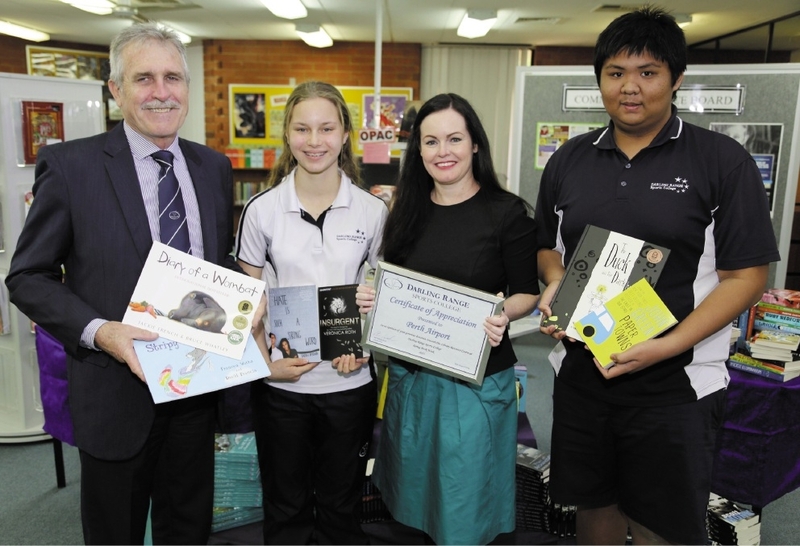 Perth Airport executive general manager of corporate affairs Fiona Lander said she hoped students would be inspired to read more books thanks to the donation.